Generally the last 1.6 miles of the Gale River Trail feel to me like a treadmill. 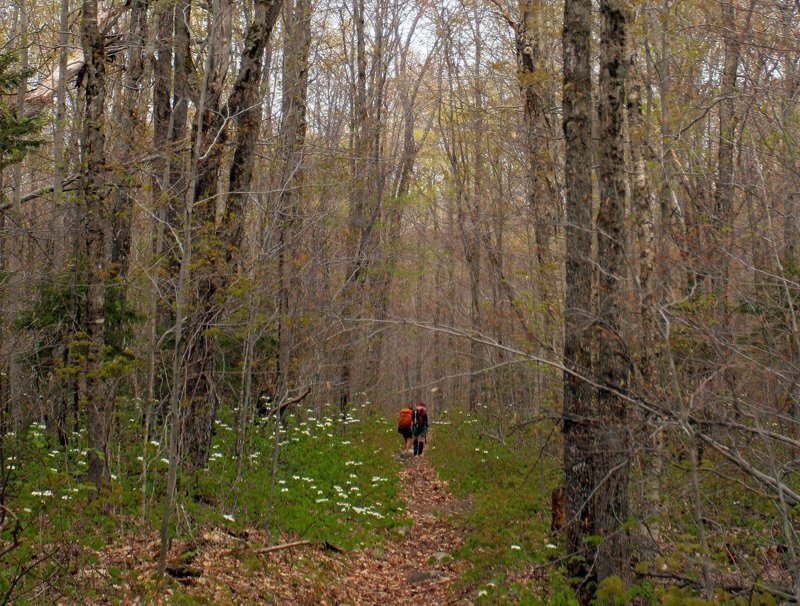 During the mid-summer the canopy has closed in, its hard to hike faster than the mosquitoes, and it's hot. 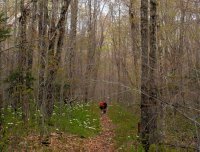 However, hiking on the trail in May is like strolling through a garden. The ephemeral wildflowers that grow on the forest floor are blooming. Painted trillium are everywhere, alone, and in pairs and threes (photo). The understory of hobblebush are covered with white blossoms which bob in the wind (photo). 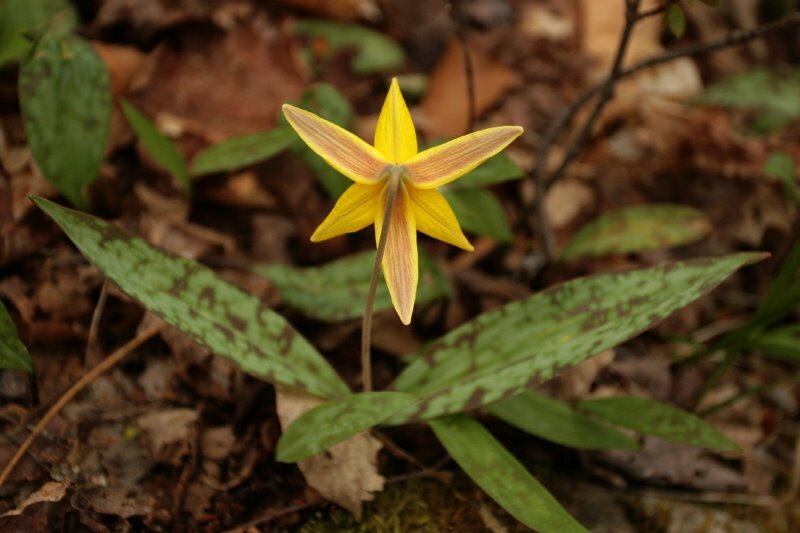 My favorite may be the shy trout lily, whose leaves are speckled like the skin of the fish, and whose flower turns its face to the ground (photo). Once the overstory of beach, birch, maple, and ash closes over the trout lily will disappear underground. For the rest of the growing season the plant will put its energies into spreading by shoots from its main root system. Along the Gale River Trail you’ll see colonies of interconnected trout lilies. Many will be juveniles with only one leaf. Once a plant has two leaves it will begin to flower. It takes seven years for a plant to reach maturity from a seed. In the photo I’ve included you can see that the flower looks like it has six petals. 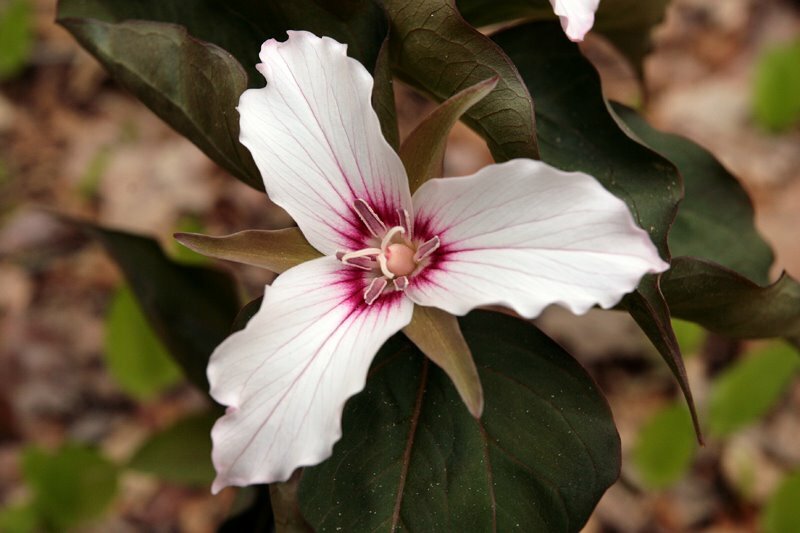 The brownish ones are actually called sepals, and are the structure that protected the budding petals. It is forecast to rain all week, but rainy days are often one of the best times to look at (and photograph) flowers. Take a walk in the woods and see what you find.